Expertly formulated, the Morning Boost and Night Cleanse teas are synergistically combined for maximum effects. The Morning Boost is designed to give you a boost throughout the day and start the morning right. It contains Green Tea, Yerba Mate and Guarana with a naturally sweet fruity taste. The Night Cleanse is designed to naturally purify the body which could lead to reduced bloating. It contains all natural ingredients to promote the restoration process. Fresh and fruity Morning Boost can replace your morning coffee/black tea and earthy and soothing Night Cleanse is the perfect bedtime ritual. It's Easy! One cup of Morning Boost tea in the morning and the Night cleanse tea every other night! 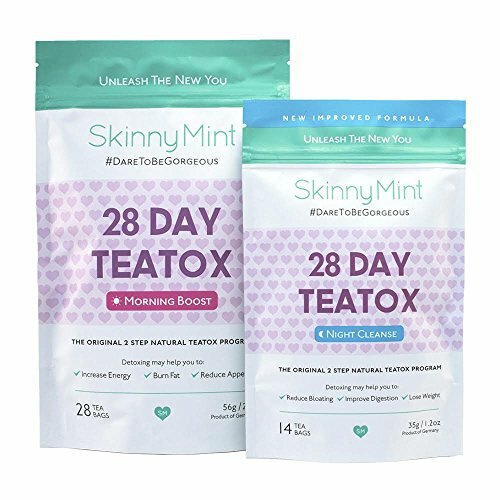 If you have any questions about this product by SkinnyMint, contact us by completing and submitting the form below. If you are looking for a specif part number, please include it with your message.